14 APR - CBC PREMIER - Gibbons treble as Sportsman win to finish fifth, whilst Intake sign out with defeat - Norton Sportsman won 4-2 at Handsworth Old Crown with the help of a Michael Gibbons hat-trick to finish a very creditable fifth in their first season in the top flight. Sportsman made a slow start and went a goal down early on to a Sam Marsden strike. Sportsman equalised midway through first half when Michael Gibbons crossed for Danny Rogers to slam home, but conceded again when some sloppy defending allowed Russel Hobson to put Handsworth back in front before half time. Midway through second half Sportsman’s greater fitness began to tell and three goals in ten minutes turned the game their way. First it was good work by James Archer when his pass found Michael Gibbons just inside the box and he curled a shot into the bottom corner. Gibbons second came when Chris Lewis, playing as a makeshift centre forward, crossed and Gibbons forced the ball home from close range with the help of a deflection off a defender on the way in. Gibbons then completed his hat-trick with the best goal of the game, playing a neat one-two with Archer before volleying home through the keepers legs. Handsworth didn’t give up though and only a terrific tip over the bar from Sportsman keeper Jack Mitchell stopped them reducing the arrears. Already relegated Intake Old Boys signed out of the CBC Premier with a 4-1 home defeat by Oughtibridge WM. It started well for Intake with a Connor Schofield cross allowing Elliott Coles to give them the lead. Both sides were then reduced to ten men after an altercation between two players and it seemed to affect Intake the most and their visitors. Oughtibridge levelled when Kurt Turner played a lovely through ball for Matt Harrison to score and ten minutes before break Wilson Coupe played a great cross field pass to Adam Thomas and he smashed Oughtibridge into the lead. Intake took risks in the second half, but it backfired as Oughtibridge twice picked them off with quick breaks. Coupe added Oughtibridge’s third, before Harrison smashed home his second on the volley from Chas Tunnard cross to complete the scoring. 14 APR - DIVISION 1 - Forum make sure the title will go to the final game - Forum (left) drew their final game of the season 2-2 at fourth place Cotts to regain top spot in Division One, but they will have to settle for the runners-up spot if Royal Earl avoid defeat in their final game of the season at Civil Sports A next weekend. Cotts had pushed the top three all the way through the season and they went ahead in this one when Michael Blythen was brought down in the area and he picked himself up to score from the spot. Forum hit back to level through Callum Mawbey before half time and they took the lead in the second half with an Andy Harrison strike, but almost before their celebrations had died down, Jon Dolan netted a second for Cotts and although both sides had chances to win it after that neither could add another. Liam Cartledge (right) became Division One’s top scorer with a hat-trick as Crookes made sure that goal difference didn't come into the equation for third place with a 5-1 victory over Southey Social in their final game of the season. 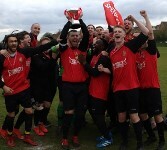 Pete Smith put Crookes in front with a header from a corner before a good sweeping move was well finished by Cartledge. A depleted Southey pressed but couldn't get one back before the break and three goals in ten minutes after the break saw Crookes take full control. Cartledge netted his second to put Crookes three up and, after Southey became even more depleted with injuries to Byron Mullen and Kieron Hopkinson, Cartledge completed his treble. James Reed added Crookes’ fifth before Carlton Carty hit a great strike for a deserved consolation for Southey. Cobden View made fifth place theirs when they came from behind to gain a 5-2 victory at Mosborough Reds. Reds took the lead when they were awarded a penalty and it was confidently put away by Jake Leonard, but an own goal by Reds skipper Jak Hotchin levelled things up. Sandile Somhedlwana then scored his first ever goal for Cpbden after four years of trying, but Reds soon levelled when Hotchin scored at the right end with a bullet header. They weren’t level for lomng though as Tim Pitt put the visitors back in front before half time. Callum McCrury and Sam Porter added two more in the second half to make sure Cobden gained their highest ever finish. Civil Sports A warmed up for next weekend’s clash with Royal Earl with a 5-1 victory over Norton Oaks B – Civil’s fourth win out of five. Tom Bamford soon had Civil two up, but Oaks pulled one back before half time when they were awarded a penalty and Jack Peake scored from the spot. There was no stopping Civil in the second half though and Steven Thompson, Was Bamford and Tapiwanashe Nyasvimbo all found the net. 14 APR - DIVISION 2 - Boynton take the title, whilst Colley clinch fourth place - Leaders Boynton Sports came from behind to beat second place Sheffield Sixs to clinch the Division Two title. The game was just two minutes old when referee Gareth Thomas pointed to the spot and Sixs’ Liam Davies put his side ahead. Boynton started to play their way into game and soon equalised through Marcus Gordon after he rounded the goalkeeper and they went ahead before half-time when Enos Huly smashed home a volley. With their man of the match, pocket rocket, Ben Jordan, running things, the second half saw Boynton take command and they increased their lead when they were awarded a penalty for handball. Simon Marsden saw his spot kick saved, but followed it up to smash home the rebound. Veteran substitute Ricardo Stewart then turned back the years to sprint clear and place a cool finish into the corner to send the Boynton sideline into raptures and secure the league title - they are pictured left with the trophy. Sixs had to console themselves with the runners-up spot and are pictured right receiving their medals and trophy. The third promotion place went to Mosborough Whites despite them slipping to a rare defeat at next to bottom Shakey. Steve Dickinson hit both goals for Shakey, whilst Whites sole reply came from Morgan Foy. Colley clinched fourth place with a 3-3 draw at the only team that could overtake them, Woodhouse Juniors. Colley went into their game knowing that they would finish fourth if they avoided defeat and they made the perfect start when they took the lead inside 60 seconds through Faisal Miladi, but within two minutes Ashley Layne levelled for Woodhouse. Colley took the lead a second time with a Christopher Onja strike only for Layne to level things up a second time. Colley took the lead a third time through Chris Fowler (left) and this time managed to hold onto it until half time. The second half was a scrappy affair and with the thought of a possible promotion place, fear grew into Colleys game and Dan Lockwood drew Woodhouse level a third time. Woodhouse knew they had to win it to stay in the hunt, but Colley held on for dear life and got the point to guarantee fourth place. Jack Hawkes grabbed a second half hat-trick as Brinsworth Phoenix completed their season with an emphatic 7-2 victory over bottom club Cadburys. Pheonix got off to a flying start when Mr Utility man Joe Stratham lobbed the keeper from the angle of the box to put them ahead after just five minutes and Brad Beedham doubled it with a left foot volley from a Brad Hardy corner. Jamie Angus pulled one back for Cadburys before the break, but the second half saw Hawkes restore Phoenix’s two goal lead and set up by Karl Fox and Curtis Gregory, he quickly added two more to take his League tally to 16. Angus pulled a second back for Cadbury and they might have been right back in the game had they not seen a penalty brilliantly saved - Cadburys third consecutive penalty miss. To add to Cadburys woes, Stratham hit Phoenix’s sixth before Nathan Darwent scored his side’s seventh with a cheeky chip over the onrushing keeper. 13 APR - TWENTYTWO CUP - Forum set for the home dressing room - The Sheffield Star's Blades reporter James Shield made the draw to see would occupy the home dressing room when the League stages it's twentytwo Cup Final at Bramall Lane and it was Forum's name that came out of the hat. The date for the final is not yet known, but will be advertised here as soon as it is known. 13 APR - Colley fundraiser for an injured player - Colley are going to hold a fundraiser for their injured player Danny Parker at the Green Lane, Civil Sports Social club on Saturday 20 April starting at 7:00 pm. All are welcome to attend. 11 APR - DIVISION 2 - Magpies fly away with the points - Woodhouse Juniors chances of a fourth place finish took a dive as Beighton Magpies completed their season with a thrilling 5-4 victory over them. Just one goal came in a tight first half when Dale Featherstone produced a calm finish. The game opened up in the second half and Lewis Hunt (right) doubled Magpies lead with a low shot, before Leon Cheslett pulled one back for Woodhouse. Dale Featherstone restored Magpies two goal lead with a 30 yard lob over the keeper, but Harry Broadbent again reduced the arrears for Woodhouse. Lee Hackett chipped the keeper for a fourth for Magpies and Hunt made it five with a classy finish for his second of the game. Woodhouse didn’t give up and Lee Williams netted a quick fire double, but Magpies managed to see the game out and climb above their hosts. The Runners-up spot in the CBC Premier will be decided this weekend when Stannington Village entertain Handsworth Old Crown. The equation is simple, if Stannington win they will be Runners-up to new champions Wadsley Bridge Pheasant, but, if Stannington fail to win, the Runners-up spot will go to Redmires. It is eleven seasons since Stannington last finished outside the top two and they will want that proud record to continue. Stannington had a 5-3 victory when they last met Handsworth and on current form it would be a big surprise if the failed to win again and make it eleven consecutive seasons they have finished in the top two and the thirteenth time in total. In Division One, Royal Earl will need to avoid defeat against Civil Sports A to pip Forum to the title. Earl beat Civil 5-1 when they met in September and will start strong favourites to win and add the Division One title to their Twentytwo Cup Final appearance, but Civil have won four of their last five to avoid the spectre of relegation so it might not be that straightforward for Earl. New Division Two champions Boynton Sports should complete their season with a home win over bottom club Cadbury, whilst Woodhouse Juniors can finish fifth by taking a point at Shakey, or the following week at Woodseats Chantrey. If Woodhouse lose both, then fifth place will go to Beighton Magpies.